Many people own Sony rear-projection HDTVs (RPTV) and remain blissfully unaware that their television is defective. Maybe they think discoloration is a normal part of TV wear – their old tube TV probably changed shades, and may have even introduced green and purple ghosts. But there is something they need to know: Every Sony high-definition RPTV ever made is defective! This includes LCoS (SXRD), LCD, and 3LCD technologies manufactured between 2002 and 2007. There seems to be a variety of issues, but the main problem is the optical block. Symptoms of a defective TV include blue blobs or haze, green blobs or haze, yellow stains, purple dots, lines similar to an Etch-A-Sketch, and other various problems. Some TVs have even partially melted. Needless to say, if your TV is not bright, crisp, and natural-looking, you probably need to consider looking for a repair, or satisfaction of some sort. For many of us, the original warranty for the TVs have expired. Sony did extend the warranty due to the pending optical block class action lawsuits, however as of this article, most of the models’ extended warranties have also expired. 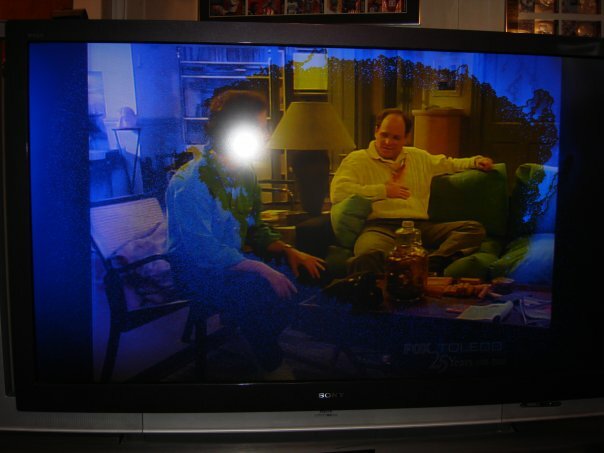 I have a Sony RPTV from 2006, and it has developed yellow staining at the top portion of the picture. I can’t share the details of anything Sony offers me, but I will write a follow up detailing my experience with Sony. What do I do about my defective Sony TV? First, visit the unofficial Sony LCD Rear Projection TV Problems website, which has in depth information on Sony, the projection technologies, the problems, remedies, and legal actions being taken. This is an indispensable source of information. If you are experiencing any problems, you can join the I Have a Defective Sony TV Facebook page. Sony monitors this page, and can provide you with information (and even send you a customer identification number). Finally, call Sony at 800-554-6908 to discuss your situation. They are available Monday through Friday 9:00am to 8:00pm EST. I recommend talking with Scott Fuentes; he is incredibly helpful, and can let you know your options. Did you folks know that Sony LCD TVs are actually made with either Sharp or Samsung LCD panels. I found this out when my Sony KDL46V3000 LCD TV panel failed less than a year out of warranty. I checked to see if just replacing the TCON pcb at about $49, would fix the single vertical red line problem in the middle of my display. I noted the part number for both the TCON pcb and the LCD panel was a Samsung part number. It turns out they must be replaced together, and the LCD panel costs more than the TV is worth. I paid a premium for the Sony brand name believing it to be more durable than Samsung or Sharp. Therefore it would seem the smarter purchase for this Joe consumer would have been to buy lower price brand models and use the Sony premium difference to pay for the extended warranty. It turns out there is a pretty high failure rate in LCD panels, and they are not repairable.